New York Road Runners introduced the R-U-N 5K as a “social” race on a Thursday night. In addition to the normal “time” corrals, there was a “social” corral for those individuals who wanted to have a social run/walk. Arriving at the race, I had a bit of an issue with the bag check. Since this was a post-work race, I – among others – brought our bags direct from work. NYRR was requiring everyone to empty their bags (including purses) into clear plastic bags in the name of security, but I felt it did the exact opposite. It exposed people’s wallets, laptops, and other valuables to would be thieves. Since the race was in Central Park, it didn’t really do anything in the name of safety except protect the 10 yards that took up bag check. Once it was race time, I took my place among the 5,100 in my normal corral and began at the 7pm start. 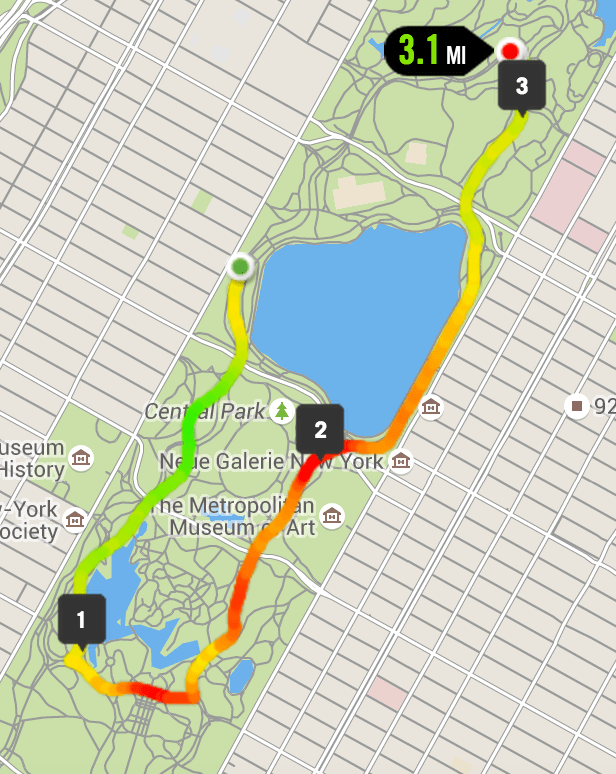 We started out on the west side of Central Park and headed south for a relatively flat first mile before turning left onto the 72nd St. transverse. In the middle of the transverse was the first water station, followed by a sparkling cider station – the first of the “social stations.” The real challenge began once we turn turned left onto the east side of the park and up Cat Hill. I hadn’t done any hill training during my rehab, so the hill was a bit of a challenge, but I was able to push through to the crest of the hill and the second social station. By 90th St. there were signs denoting 10 feet of space and a barely audible boom box denoting a “dance station.” Conitnuing north to the 102nd St. transverse, we made our final left turn directly towards the finish line for our last tenth of a mile. Having run similar courses so many times in the past during marathon training, I was used to the course. My injury and lack of running caused me to not run it as well as I have in the past, but I was able to finish with a respectable 28:12 finish. I look forward to continuing to get back to running and improving so that I can return to marathon running when I heal again.